Boston, You’re My Home is the story of a young girl named Sweet Caroline who is nervous about her family moving to the city. Worried about the unknown, her mother and father attempt to soothe her fears by telling her a bedtime tale inspired by Boston’s attributes of strength. Including everything from scholarly education to delectable seafood treats, Caroline slowly begins to learn about the wonderful benefits of calling Boston her new home. All of the author’s profits will support the One Fund. Suzie Canale published this unique book through the Mascot Books Author Program. The Mascot Books Author Program allows prospective authors to publish their books in a way that combines the freedom of self-publishing with all the support a publishing industry leader has to offer. 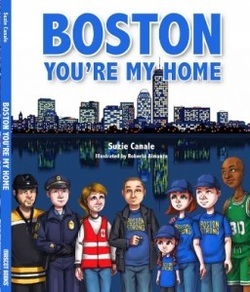 To purchase Boston, You’re My Home, and for more information about the Mascot Books Author Program, please visit www.mascotbooks.com. Boston You're My Home is an inspirational story about all that the beautiful city of Boston has to offer. Sweet Caroline and her family are moving and she is afraid to move to the city. Her parents share a special bedtime story with her giving her ten reasons that make Boston the perfect place to call home. Will it be enough to convince her to move? Boston You're My Home is a wonderfully written and charmingly illustrated story that takes readers on a tour through Boston. Children will discover amazing places like the Hatch Shell, The Emerald Necklace, Castle Island, and so much more. However, just as Sweet Caroline learns, the most impressive part of Boston are the remarkable people who live there and the strong bond they share. I highly recommend picking up a copy of Boston You're My Home. Available on Amazon and Mascot Books. "The Beantown Tales are wonderful books with themes about clean water and air, endangered wildlife protection, and humanitarian kindness. Written and imagined by Suzie Hearle Canale and her 2 little boys! I sat next to her at a book signing recently and who would not be drawn to books with titles such as “The Land of the Chocolate Cosmos” and “The Popcorn Hydrangea of Poppington”?! Gardening and candy, a great combination for kids! Can’t wait to give these books to some special kids I know…"
-Ellen Sousa, Author of "The Green Garden"
Mascot Books is thrilled to announce the second annual "Author of the Year" Award. This year, Mascot Books published over 100 books—children's picture books, to early-chapter and young adult titles, to cookbooks and current event titles— from authors around the world. This year's Mascot Books "Author of the Year" is...Suzie Hearl Canale! Suzie has close ties to the floral industry being the much better other half of Rick Canale, Exotic Flowers, Boston. She developed the concept of The Beantown Tales, a series of books geared towards educating children to make positive changes within the key concerns of our society. Suzie's books are the recipient of the Green Book of 2011 by the Massachusetts Green Schools Organization as well as three Honorable Mentions in the 2011 New England Book Festival (The Land of Chocolate Cosmos), 2012 New York Book Festival (The Candy Roses of Cape Care) and the 2012 Hollywood Book Festival (The Popcorn Hydrangea of Poppingtom). The Candy Roses of Cape Care by Suzie Hearl Canales is an inspiring story about the importance of preserving the ocean, our "most cherished and precious resource, that covers seventy percent of our earth." The story takes place on the Island of Cape Care which is home to rare and precious flowers known as "Candy Roses." These magical roses have no ordinary bloom, but one with a tasty candy treat. The Island of Cape Care has the cleanest oceans and the "Candy Roses" flourish. People came from miles around to fill their buckets with delicious candies. Unfortunately, along with people comes garbage and soon the beaches are contaminated. The roses no longer produced their mystical treats and the island children are very sad. One group of children feel so much sorrow at the loss of their beautiful beach, but instead of pouting they decide something must be done. Can the children rally the island people and save the "Candy Roses?" The Candy Roses of Cape Care is a clever story that encourages readers to take care of planet earth and all of the precious resources she offers. Children will also delight in the lively rhyme and vivid illustrations which make a lasting impression. I recommend reading The Candy Roses of Cape Care. Pick up a copy at www.amazon.com. 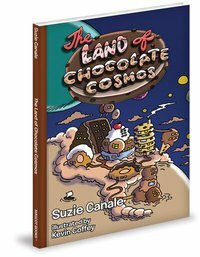 The Land of Chocolate Cosmos by Suzie Canale teaches children (and adults) the importance of conserving and recycling in order to save our natural resources. In the Land of Cosmos a magical flower grows. The flower, called chocolate cosmos, turns everything to chocolate because of "a spell within its scent." The town is well known for the delicious chocolate treats made from the flower. But, because of their greed the town fails to listen to one smart boy named Coco, who sees all their waste and disregard for the precious flowers. Soon the chocolate cosmos began to disappear along with their enchanted scent. Will Coco be able to help the townspeople learn to conserve and save what remains of the chocolate cosmos? Suzie Canale uses clever rhyme to engage young readers and to communicate her important message of appreciating nature and protecting our resources before they are gone. "I believe both "The Land of Chocolate Cosmos" and "The Popcorn Hydrangea of Poppingtom" will succeed in helping the youths of the United States learn about the importance of preservation and conservation. A highlight for me I would have to say is the page in the back devoted to the actual plant that inspired the story. Including that really helped to tie in the fantastical elements of the story with the world around us. I also applaud your ability to rhyme, you have quite a talent. Sincerely,Max Weber (Events Coordinator, The Book Cove, R.I.)"